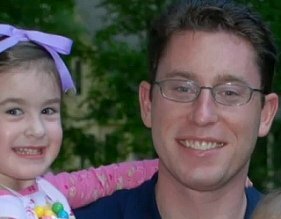 It was not a Happy Thanksgiving for the family of 36-year-old Russell “Rusty” Sneiderman, a prominent Jewish businessman who was assassinated in Atlanta, last week, as he dropped his son off at pre-school. And check out the sketch of the man witnesses saw do it. As reader Joe pointed out, the guy looks like a Muslim, mostly because of his beard and some of the facial features. And the man is described as a White man. Few non-Muslim White men wear the kind of beard in the sketch. And few non-Muslim White men have the kinds of facial topography illustrated in the photo. Yes, that mustache-less, “Planet of the Ape Man” beard isn’t just an Amish or Mennonite thing. It’s a Muslim thing, found mostly in Sunni Islam, not Shi’ism. Many devout Sunni Muslims wear such a beard because it’s in fact a Muslim form of facial hair–considered “Sunnah” or of Mohammed because that’s reportedly how Mohammed wore his beard. Also, the Hadith–which are considered the word of Mohammed and as authoritative in Islamic law as the Koran–require men to shave the mustache area closely and spare the beard from a trim. Some Muslims say this is because it’s unsanitary to have the germs and/or particles trapped in a mustache go into a drink or food. And others say it is worn to distinguish Islamic men from women (hey, they said it; not me). I haven’t drawn any conclusions, and we may never know who murdered Rusty Sneiderman. It may turn out to be your average White dude hitman who has a thing for the Planet of the Ape Men. But again, look at the photo. Sure looks like a follower of Mohammed to me. Although it appears that Sneiderman and his wife were typical Jewish liberals (who generally pander to Muslims and serve as their chief apologists), that makes no difference in global jihad. Liberal Islamo-pandering Jews, like Daniel Pearl, are eagerly cut up like chickens by Muslims, in a New York minute. Ignoring the facial features and blaring cues in the sketch doesn’t make them incorrect. And we ignore them at our peril. As I noted earlier this year, authorities refused to put out a correct sketch of stabbing serial killer, Elias Abuelazam, a Palestinian Arab who targeted Black people for extinction. 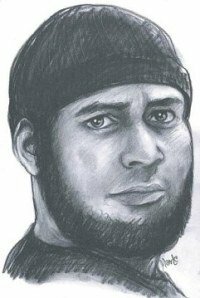 The sketch looked like your average White guy in a baseball cap, not an Arab from the Middle East. Had the sketch been accurate, Abuelazam might have been caught sooner and less people might have died at his hands. That nose on the sketch just ain’t your average White guy’s nose. Not even your average White hit man’s nose. And saying so isn’t “bigoted.” It’s intellectually honest and could help catch this murderer sooner. I will be following this story, though if the killer does turn out to be Islamic, I bet we’ll never hear about it. You know– it gets in the way of the “religion of peace” meme and all that. THE KILLER TURNED OUT TO BE ANOTHER JEW .. AN ISRAELI JEW. JEWS ARE (ACCORDING TO THIS BLOG) NASTY VIOLENT KILLERS! Well it looks like your “reader” was dead wrong. The suspect that they arrested is no more Muslim than I am and I’m a Christian. Instead, the suspect was Jewish just like the victim. I have to laugh at all the “theories” posted here when they had no evidence at all to support them! He never had a beard, but a fiber found in his car is “consistent” with fibers known on fake beards. Cheers to all you Sherlocks out there!